Well, I got the job in Chicago and will moving there after Thanksgiving. It's a big step and I'm quite nervous about it since I still have to find housing and get a lot of stuff done within the next couple of weeks. However, I'm looking forward to exploring all that a big city like Chicago has to offer and am excited to turn the page and enter into this new chapter of my life. Unfortunately, I may not have as much time to dedicate to the site as I have previously since I will likely be working longer hours than I was in my old job. I will still continue to write my weekly waiver wire article. It's just that I may not get to all of your specific questions via comments, email, forums, Twitter, etc. as quickly as I normally do. Thanks for understanding. 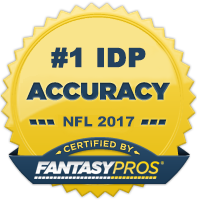 Now on to the IDP stuff! Brian Cushing's move to the outside (on most defensive snaps) seemed to directly benefit his box score performance as he posted 9 solo tackles in a losing effort in Jacksonville. This is good news for Cushing owners. I would expect him to be a solid LB2 the rest of the season. Greg Toler had a yet another solid tackling performance last week as he put up 8 solo tackles against the Seahawks. However, he played so poorly that he was benched in favor of Mike Adams. It is unknown whether this move is permanent or not. This would be a big blow to Toler owners if he was demoted to nickel cornerback. Glover Quin had a ridiculous 13 solo tackles in Week 10. This is an aberration. Garrard was just taking the 7 or 8 yard out patterns Quin was consistently allowing. Pat Chung returned to action Sunday night after missing the previous two weeks with a knee injury. He looked fantastic. He was flying around pursuing the ballcarrier and he blitzed the quarterback on numerous occasions. He reminds me a lot of Rodney Harrison in his hay day. He did leave the field a few times with an apparent injury, but he later revealed that he was just bothered with cramps. He looks to once again be a solid DB1 option moving forward. D.J. Williams was benched for the early portion of Sunday's blowout game verse the Chiefs and consequently only had two total tackles. His replacement, Joe Mays, had 7 solo stops and looks to be a very viable waiver wire pickup if Williams does indeed miss any time. "Stylez" White completely disappeared in Week 10 against Carolina. No tackles, no sacks, no pass deflections, nothing. Seriously, if you're going to legally change your name to "Stylez," should be at least be able to get a sack or three against the Panthers. Chris Clemons continues to be a godsend for IDP owners who picked him up after the first few weeks of the season. He had two sacks against AZ giving him 7.5 on the season. He's quickly entering into low DL1 territory. He gets the job done when he's suppose to get the job done (i.e. against bad offensive lines). 1. RDE Chris Long (STL) vs. ATL - Ever since I ripped on Long in Week 4, he's had a 1/2 sack or more in 5 of his last 6 games. Long has been close to busting out since entering the league in 2008. He was pressuring the quarterback on a consistent basis, but just wasn't finishing. As the defense around him starts to improve, Long is only going to get better. His matchup this week isn't great, but it's time to jump on the Long bandwagon in both redraft and dynasty leagues. 2. RDE Haloti Ngata (BAL) @ CAR - Ngata (whom I recommended last week) did "natta" in the box scores. Chances are good that he does something significant against the helpless Panthers this week as he looks to redeem himself. 3. DTs Richard Seymour/Tommy Kelly (OAK) @ PIT - Both Seymour and Kelly have been playing great as of late and are likely available on most waiver wires. Kelly has had a sack in five consecutive games and Seymour is fresh off an 8 tackle performance in Week 9. They are both good options in DT-required leagues this week against Pittsburgh. RDE Jared Allen (MIN) vs. GB - To all those Jared Allen naysayers out there, I say "nanny nanny, boo boo." After a piss-poor first seven weeks of the season, Allen has really turned it on as of late registering 9 tackles (2.5 TFLs) and 3.5 sacks. If he's available in your league, he's a must grab. Not only does he have has confidence back, but he also has one of the easiest remaining schedules for fantasy defensive linemen (GB, WAS, BUF, NYG, CHI, PHI, DET). 1. SILB Paris Lenon (ARI) @ KC - Lenon continues to be productive in the tackle column even with the return of Gerald Hayes. I would expect that solid production to continue this week against the Chiefs and their run-heavy offensive attack. Lenon is a comfortable start as an LB3 this week. 2. ROLB Cameron Wake (MIA) vs. CHI - For people that follow the defensive side of the ball closely, Wake's emergence this year comes as no surprise. If you extrapolate out his 2009 QB pressures, hits, sacks, etc. to a full-time player's amount of snaps, he was the most effective pass rusher in the NFL. Now as a three-down linebacker this season, Wake has capitalized on his increased amount of opportunities with 8.5 sacks this season. He faces the Bears this week and even though they've been protecting Cutler better as of late, they are still quite bad at pass protecting and Wake should be a great play in big-play scoring systems and as a LB3 in tackle-heavy scoring systems. NOTE: Wake did injure his hip in Week 10 and his status is uncertain for this week's game. So be sure and check his injury status throughout the week before you insert him into your lineup. 3. WLB Nic Harris (CAR) vs. BAL - The converted safety got the starting nod over Jordan Senn last week and ended up leading the team in total tackles with 11. He has a very nice matchup against Baltimore this week and should have another solid game. His value (much like Dan Connor's was) is going to be determined largely by matchup and whether or not the offense uses a lot of spread formations since Harris is only a two-down linebacker. 4. ROLB Tamba Hali (KC) vs. ARI - I could basically copy and paste much of what I said previously about Cameron Wake and it would apply to Hali. He was a very underrated pass-rusher last season and it's not much of a surprise that he's finally breaking out this year. He's got a great matchup against the Cardinals and has a high probability of registering a sack or three. He's only had two games all season in which he hasn't sacked the QB and he's followed up both of those sackless games with a sack in the following week. Guess what? Hali didn't have a sack last week. I'm smelling a big game out of Hali this week. He's a must start in big-play IDP leagues this week. MLB Stewart Bradley (PHI) vs. NYG - I'm still harboring a grudge against Bradley for burning me a few weeks back when he was my linebacker "Lock of the Week." His play has improved as of late, however, and he has a superb matchup against the Giants. Opposing linebackers have been racking up tackles against the G-Men left and right (Bradie James and Keith Brooking combined for 23 total tackles last week against them). This is the week to get Bradley into your lineups. 1. RCB Dimitri Patterson (PHI) vs. NYG - I was hyping up Patterson as a potential waiver wire gem on my Monday night radio show and as it turns out he had a breakout game with 4 solo tackles and 2 interceptions (1 for a touchdown). Patterson is in a great position to put up a good amount of fantasy points the rest of the season or for at least the next few weeks; he's a young, inexperienced corner opposite a Pro Bowl caliber cornerback in Asante Samuel. Therefore, teams are going to continue to test him and he will get plenty of tackle and interception opportunities (a la Greg Toler). He's got the juggernaut Giants offense this week and should continue to produce at a above average level. 2. FS Brian Dawkins (DEN) @ SD - Dawkins is one of those old crafty veterans that seems to produce a decent amount of fantasy points for owners year in and year out. He missed Weeks 6 and 7 and had a week 9 bye week so he's been dropped and forgotten about in a lot of leagues. "BDawk" is usually good for 4-6 solos and a decent chance for a big play every week. He has the pass happy Chargers coming to town which should be good news for Dawkins and his tackle production. This is probably going to be one of his better games of the year. 3. RCB Brent Grimes (ATL) @ STL - Grimes is quickly developing into one of my favorite IDPs. He's a small, scrappy undrafted free agent out of Shippensburg who always seems to put up solid tackle numbers when given a chance to start in Atlanta. He's averaging 6.6 solo tackles per game and has 2 interceptions over his last 6 games. He's been fairly matchup independent during that stretch and therefore remains a good play this week against the Rams. SS Jim Leonhard (NYJ) vs. HOU - "Lion Heart" has put up solid numbers in the tackle column so far this season. He hasn't had less than 4 solo tackles since Week 2 of the regular season and has perhaps his best matchup of the year this week against the Houston Texans. Plus, he returns punts for those owners in leagues that reward for return yards. He should have 6-8 solos this week and be a solid DB2 option.